THE BARBARIAN AND HIS BATTLEPUG COMPANION are a nearly unbeatable team, but after one of his motley crew of adventurers goes missing, the last Kinmundian must split off from his friends and journey, alone, into the heart of the den of the pirate king to find him. The rest of the group must fend for themselves while Catwulf’s ferocious forces hunt them down. But with a BATTLEPUG at their side, they at least have a fighting chance! Queenie --- Like it says in the introduction, "come for the pugs, stay for the adventure". Dani --- I agree. Fans of eccentric humor, and especially those who enjoy absurd mash-ups, will continue to be charmed by Mike Norton’s Battlepug webcomic. This latest book, THE DEVIL'S BISCUIT, is number 4 in the series, and continues the epic story with a collection of comics from the past year. As always, the artwork continues to be stellar, the coloring beautifully rendered, plus the panel layout is varied and interesting. Queenie (sighing dramatically) --- It’s a pleasure to read this book just for the visuals. That is one hunka hunka burning pug! Toby --- You keep taking the book to your kennel! I want to read it again! Queenie --- I have seniority, I’m in charge of the book. You’ll just get drool all over it. Toby --- Ha! You’re the one who’s doing all the drooling! Dani --- If you two will just focus on the review, I promise I’ll get an extra copy so you each can have your own. Deal? Dani --- All sweeping sagas have mysteries to be solved, and the opening scene confronts us once again with what just might prove to be the biggest mystery of all – our naked narrator, Moll. Confined to a tower high above a sprawling city, the beautiful woman has only a surly French bulldog (Colfax) and an affable pug (Mingo) for company. Queenie --- Everyone knows, if you have a pug, you have it all. Toby --- I can’t hear you, you’re mumbling! Dani (aloud) --- I was saying that you two are the light of my life, of course! While it’s true that pug companionship is very satisfying, this time we get a glimpse of secret sadness in Moll, a heaviness of heart that surprises her canine companions. Nevertheless, she continues to tell them the adventures of BATTLEPUG. Toby --- SPRINKLES! His name is Sprinkles! I wish my name was Sprinkles. Dani --- Back on topic, guys! Anyway, all the reader really has to do is picture Conan the Barbarian riding a pug the size of an elephant in order to understand the quirky universe that Mike Norton has created. Our nameless Kinmundian warrior is on a quest for vengeance against his mortal enemy, Catwulf. Despite the hero’s desire for solitude on this mission, he's attracted both a genuine Canis Majoris and some unwanted followers. Book 3 showed us that, in spite of himself, he’s learned to care about his motley crew. As Book 4 opens, we again meet Scribbly, a crazy and mostly incoherent old hermit who nevertheless manages to explain what's going on to both the Warrior and the reader. Toby – And Bryony’s back! She’s the one who named Sprinkles. Dani --- Good for you, Toby. You remembered. Dani --- Anyway, Bryony Bracken is a little girl with enough powerful magic to control and command the plant world. Queenie --- She has a powerful vocabulary too! She cusses like a drunken sailor. Dani --- That’s right, Queenie. Queenie --- And then they’re saved by a brand new character, Leighmin, a plant wizard like Bryony! Have you noticed that people come and go all the time in this story? Dani --- True enough. In fact, Scribbly disappears during the struggle and can’t be found. Meanwhile, the new plant wizard reveals himself as a guide and mentor. Our heroes are used to a certain amount of weirdness by now. But they're unprepared to hear that they must split up and follow separate paths for a while. So for the first time since he met the big lug of a pug, the Kinmundian will have to leave his faithful steed behind. Dani --- But first, he charges Sprinkles with the very important task of guarding Bryony, who has a destiny of her own to fulfill. And we know that the giant pug and little wizard girl will look after each other, right Toby? Queenie --- Ha! It’s a wonder he knew how to put them on. Apparently it's the first time he's worn pants since he was a kid. Dani --- The important thing is that he spots Scribbly in the crowd and tries to follow him. A gang of thugs descend on the cape-covered old man, only to be beaten off by the Warrior. But it isn't Scribbly under the cape! Instead, it's a very small armor-clad human who introduces himself as Jangles the Lesser. Queenie --- What did I just tell you? People come and go all the time in this story. Dani --- NO SPOILERS! In fact, we’ve already said too much. What we can say, however, is that from this point on, the plot gets REALLY complicated. Toby --- I’ll say! It made my brain hurt! Queenie --- Everything makes YOUR brain hurt. Toby --- Well, it’s not just me. Mingo’s brain got BROKEN in this story! Dani --- Okay, I admit, it’s pretty good. Dani --- Is he okay? Queenie --- Yeah, he’s breathing, he’s fine. *kicks a couch cushion over Toby * What I want to know is how the writer’s going to resolve all this stuff with only one more book? Queenie --- Are you kidding me? It has pugs! It even has a pug MOUNTAIN this time! Automatic five! Toby (from under the couch cushion) --- Yeah, it should be five! Dani (sighing) --- We have this argument every time we review a Battlepug book. Look, if we were reviewing it for a pug audience, it would be five. But we’re reviewing this for humans, so it gets four. 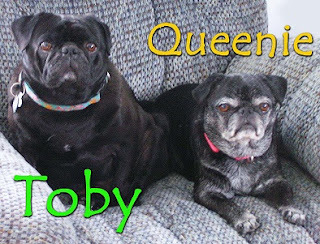 Toby --- I’ll bet if the Battlepug was here, you’d give it a TEN! Dani --- Okay, that’s probably true. Tell you what, I’ll give FIVE “pug-kisses-are-totally-unavoidable” sheep to the bonus pages in this book. 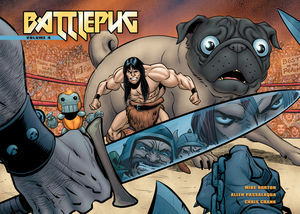 There’s a fun collection of the Warrior and the Battlepug drawn by over a dozen guest artists.